Last night I got a call from a friend asking me for gluten free recipes, so she can make them for her daughter, who has a lot of food restrictions. So, today I was on an experimental mode…and boy did the experiment turned out delicious!!! I had bought taro root flour, which is a product created by a local chef here in Panama (Chef Melissa de Leon). She has an extensive line of amazing gluten free flours made from tropical vegetables (plantain, sweet potato, taro root, tapioca). These buns are gluten-free and fluffy. If you don’t have access to taro root flour, you can try with tapioca starch. Pre-heat the oven at 350. In a big bowl, mix the first 4 ingredients. Then add the eggs, warm water, coconut oil and artisan cheese. Knead the dough with your hands until everything is well blended. It will have a sticky consistency. Line a baking sheet with parchment paper. With your hands create the buns (about a 2 inch diameter). Place them in the baking sheet and leave a space of an inch between them, cause they will duplicate in size while baking. Place the baking sheet in the oven and cook for 20 minutes, then turn the baking sheet around and bake for 15 more minutes. The buns will be ready when you insert a knife and it comes out clean. Anoche recibi una llamada de una amiga pidiendome recetas sin gluten para poderle hacer a su hijita, que tiene muchas restricciones de comida. Así que hoy amanecí en modo experimental…y no saben lo delicioso que salio el experimento!!! 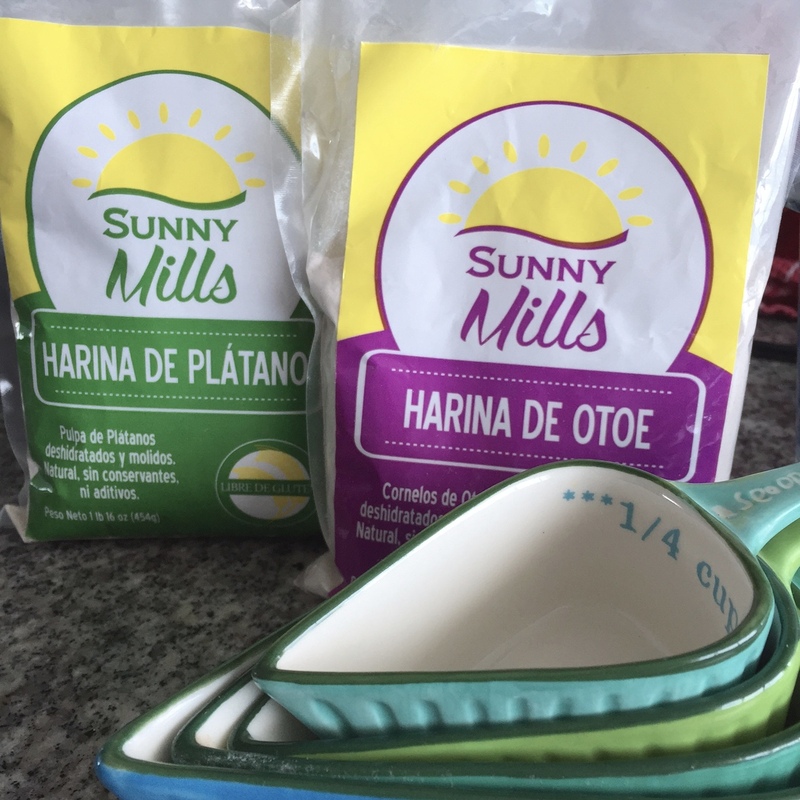 Habia comprado esta harina de oboe, un producto creado por una chef local de Panama (Chef Melissa de Leon). Ella tiene una extensa linea de harinas sin gluten espectaculares hechas de vegetales tropicales (plantain, sweet potato, taro root, tapioca). Estos panecillos son sin gluten y esponjositos. Si no tienes acceso a la harina de otoe, puedes hacerlos con harina de yuca. Pre-calienta el horno a 350. En un bol grande, mezcla los primeros 4 ingredientes. Luego agrega los huevos, agua tibia, aceite de coco y queso blanco. Mezcla la masa con tus manos hasta que todo este bien incorporado. Va a tener una consistencia pegajosa. Alinea una bandeja de hornear galletas con papel pergamino. Con tus manos crea los panecillos (aprox. 2 pulgadas de diametro). Ponlos en la bandeja de hornear y deja un espacio de 1 pulgada entre cada uno, ya que van a crecer el doble mientras se hornean. Pon la bandeja en el horno y cocina los panecillos por 20 minutos, luego dale la vuelta a la bandeja y cocinalos por 15 minutos mas. Los panecillos estaran listos cuando insertes un cuchillo y salga limpio. The only time during the week in which we eat bread is on shabbat (and sometimes if there is leftover challah, then sunday brunch is the perfect excuse to finish it). So I felt like baking this shabbat and looked for a lot of recipes online. After much research I mixed two recipes to make Challah with sun dried tomatoes and fresh oregano. It was heavenly. I never saw a bread disappear so fast in front of my eyes. Sprinkle the yeast over the water in a small bowl, and add a healthy pinch of sugar. Stir to dissolve the yeast and let stand until you see a thin frothy layer across the top (it shows its active). Whisk together 4 cups of the flour, sugar, and salt in a separate bowl. Make a well in the center of the flour and add the eggs, egg yolk, and oil. Whisk these together to form a slurry, pulling in a little flour from the sides of the bowl. Pour the yeast mixture over the egg slurry. 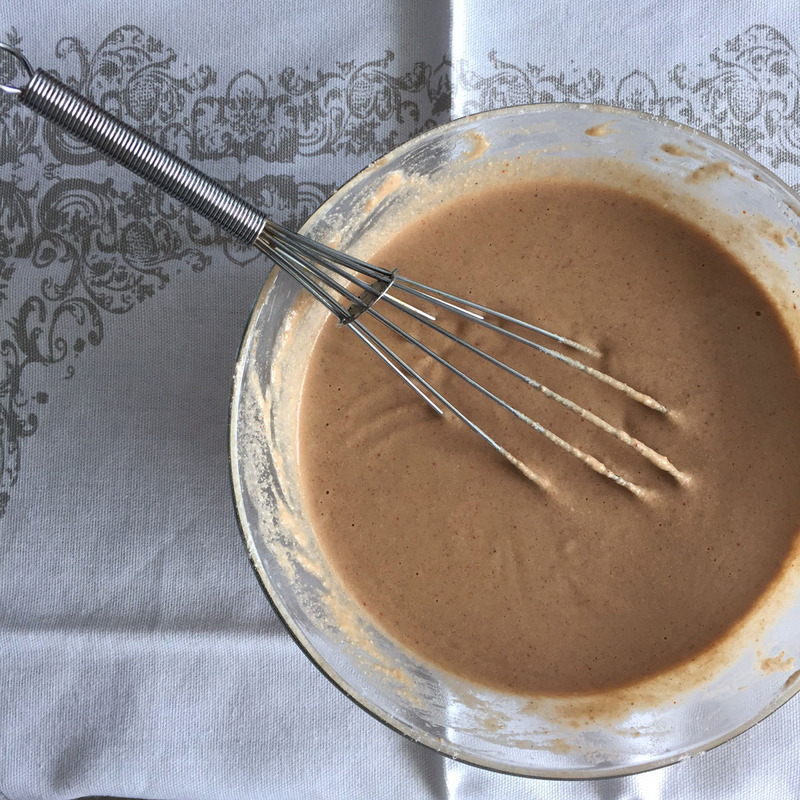 Mix the yeast, eggs, and flour with a long-handled spoon until you form a shaggy dough that is difficult to mix. Turn out the dough onto a floured work surface and knead by hand for about 10 minutes. 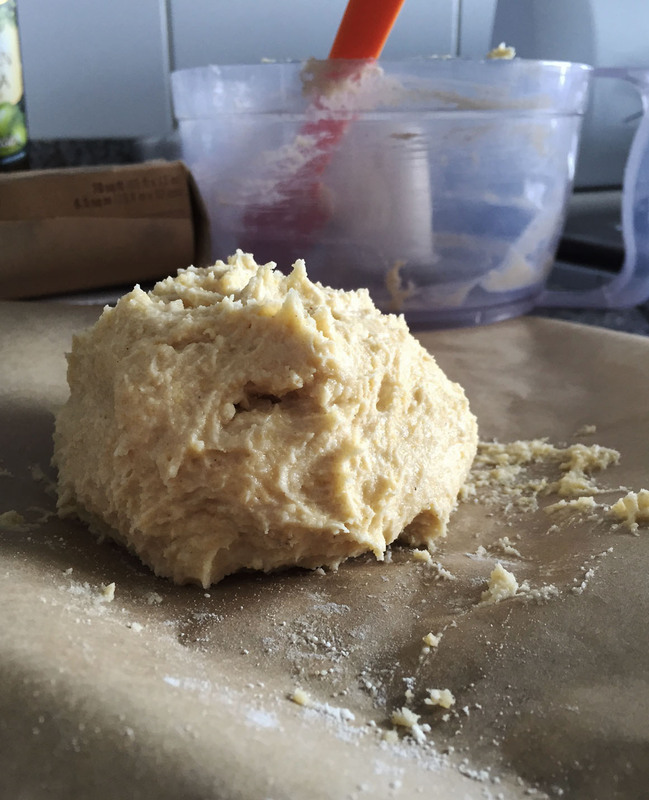 If the dough seems very sticky, spray a little oil until it feels tacky.The dough has finished kneading when it is soft, smooth, and holds a ball-shape. Place the dough in an oiled bowl, cover with plastic wrap, and place somewhere warm. Let the dough rise until doubled in bulk, 1 1/2 to 2 hours. Separate the dough into six equal pieces. Roll each piece of dough into a long rope roughly 1-inch thick and 16 inches long. With your fingers flatten the ropes and put the sun dried tomatoes and oregano in the center. Close the ropes and roll them again, so they are tight and filled with the sun dried tomato oregano mix. Gather 3 ropes and squeeze them together at the top. Braid the ropes together like braiding hair or yarn and squeeze the ends together when complete (repeat with the other 3 for the second challah). Line a baking sheet with parchment and lift the loaves on top. Sprinkle the loaves with a little flour and drape it with a clean dishcloth. Place the pan somewhere warm and away from drafts and let it rise until puffed and pillowy, about an hour. About 20 minutes before baking, heat the oven to 350°F. When ready to bake, whisk the reserved egg white with a tablespoon of water and brush it all over the challah and sprinkle with sesame seeds. Slide the challah on its baking sheet into the oven and bake for 30 to 35 minutes, rotating the pan halfway through cooking. The challah is done when it is deeply browned and registers 190°F in the very middle with an instant-read thermometer. Let the challah cool on a cooling rack until just barely warm. Enjoy! La unica vez en la semana que comemos pan es en shabbat (y aveces si sobra challah, es la excusa perfecta para acabarla en el brunch del domingo). Esta semana tenia ganas de hornear pan asi que me puse a buscar recetas online. Despues de mucha investigation, mezcle 2 recetas para hacer challah de tomates secos y oregano fresco. Quedo como caida del cielo. Nunca vi un pan desaparecer tan rapido frente a mis ojos. Espolvorea la levadura sobre el agua en un bol pequeño y agrega una pizca de azúcar. Revuelve para disolver la levadura y déjala hasta que se forme una capa espumosa en la superficie (esto demuestra que la levadura esta activa). En un bol grande mezcla 4 tazas de harina, azúcar y sal. Haz un hueco en el medio de la mezcla y agrega los huevos, la yema y el aceite. Bate bien los huevos, dejando que se junte un poco la harina de los lados. Agrega sobre los huevos el agua con la levadura y mézclalo todo con la harina hasta que se haga una masa seca que es difícil de mezclar. Pon la masa en una superficie limpia y enharinada y amasala con las manos por unos 10 minutos. Si se te pega la masa a la superficie o las manos, agregale un poquito de aceite en spray. La masa esta lista cuando esta suave y se puede hacer una bola con ella. Pon la masa en un bol engrasado y tapala con papel plástico y colocala en un area calida. Deja que la masa crezca hasta doblar su tamaño, 1 1/2 – 2 horas. Separa la masa en 6 partes iguales. Rueda la masa hasta formar una cuerda de 1 pulgada de ancho y 12 de largo. Con los dedos aplasta la cuerda y pon los tomates secos y oregano en el centro. Luego vuele a cerrar las cuerdas y enrrollalas de vuelta para que se cierren bien. Para hacer una challah, agarra 3 cuerdas y aprietalas juntas en la parte de arriba. Trenza las cuerdas como cuando trenzas el cabello y aprietalas al final cuando termines (repite con las 3 restantes para hacer la segunda challah). Alinea una bandeja de hornear con papel pergamino y pon las challah encima. Pon la bandeja en un lugar calido sin corrientes de aire y tapalas con un trapo seco. Deja que las challahs crezcan hasta que esten gorditas, como una hora. Unos 20 minutos antes de hornear, calienta el horno a 350°F. Cuando estes listo para hornear, bate la clara de huevo y con una brocha cubre las challah con esta mezcla y espolvoreale semillas de ajonjolí. Introduce las challah en el horno y hornealas de 30 a 35 minutos, rotando la bandeja a los 15 minutos. Las challah estan listas cuando las veas doradas y te marque 190°F cuando introduzcas el termometro en el centro. Déjalas enfriar en una rejilla hasta que esten tibias. Disfrutalas! Preheat oven to 350F degrees. 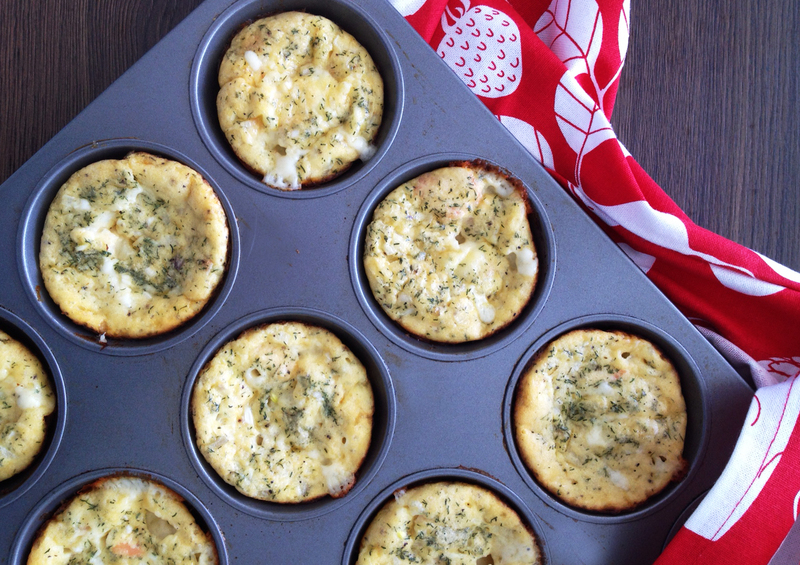 Line muffin pan with muffin paper cups. In a bowl, with a whisk, combine bananas, coconut milk, oil, erythritol and eggs. Add dry ingredients, flour, oats, cinnamon and baking powder and whisk until well incorporated. Fold in cranberries and almonds. With a spoon, fill each muffin cup 3/4 of the way. Bake for 25-30 minutes or until toothpick comes out clean when inserted in one muffin. Precalienta el horno a 350F degrees. Len el molde de muffins, coloca los copitos de papel. En un bol, combina los guineos, leche de coco, aceite, erythritol y los huevos con un mezclador de mano. Luego agrega los ingredientes secos, harina, avena, canela y polvo de hornear y mezcla bien. Incorpora los arándanos y las almendras. Con una cuchara, rellena cada molde de muffin hasta 3/4 de su capacidad. Hornea por 25-30 minutos o hasta que insertes un palillo en un muffin y salga limpio. 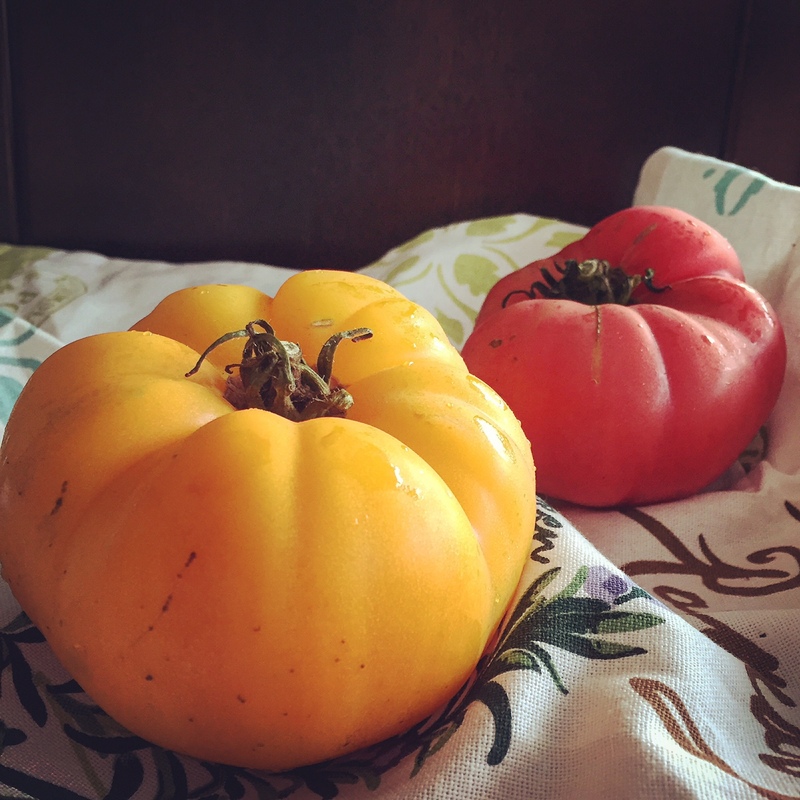 I bought these beautiful Heirloom tomatoes with this recipe in mind. 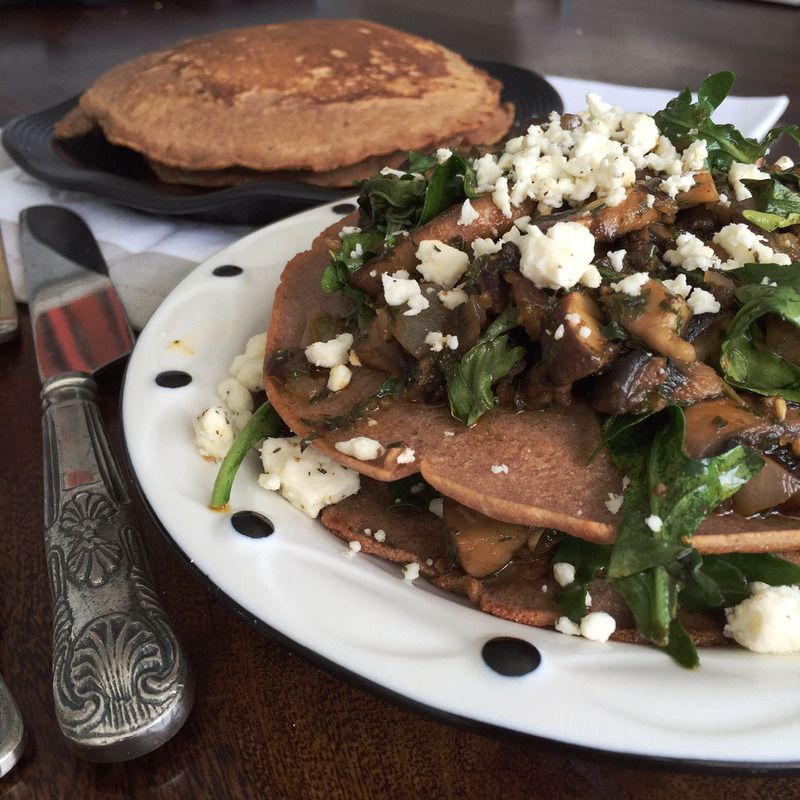 This was my first time making galettes and they came out delicious, so worth trying this one out! Combine flour, almond meal and cornmeal and salt and butter into food processor. Process until the mix looks like a course meal. While the processor us running, add in your ice water through the chute at the top of the machine. Process the mix until it is just combined. Take out the mix, make a ball and wrap it up in parchment paper and put it in the refrigerator for 30 minutes. Cut the heirloom tomatoes and shallots. 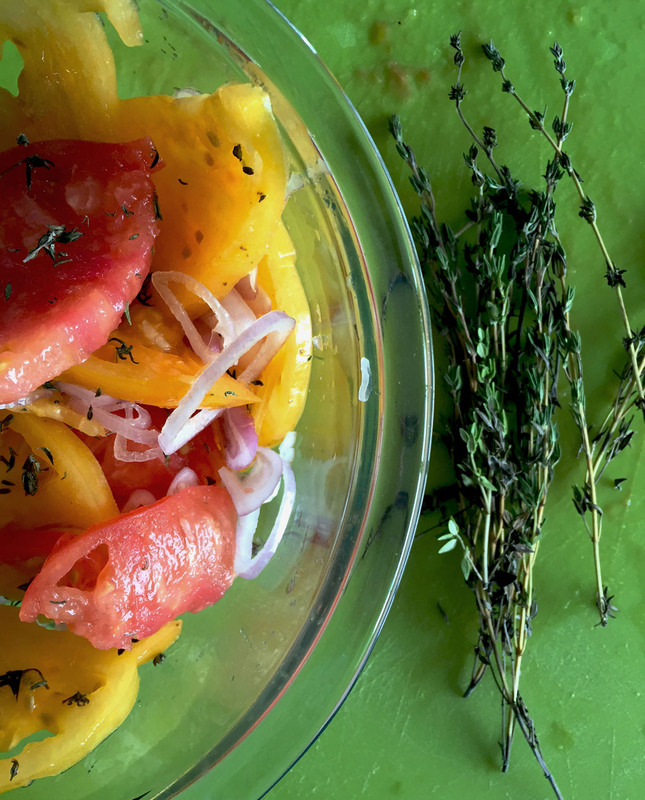 Put them in a bowl and add salt and pepper to taste, the thyme and a drizzle of olive oil. Mix well. After 30 minutes, unwrap the dough. 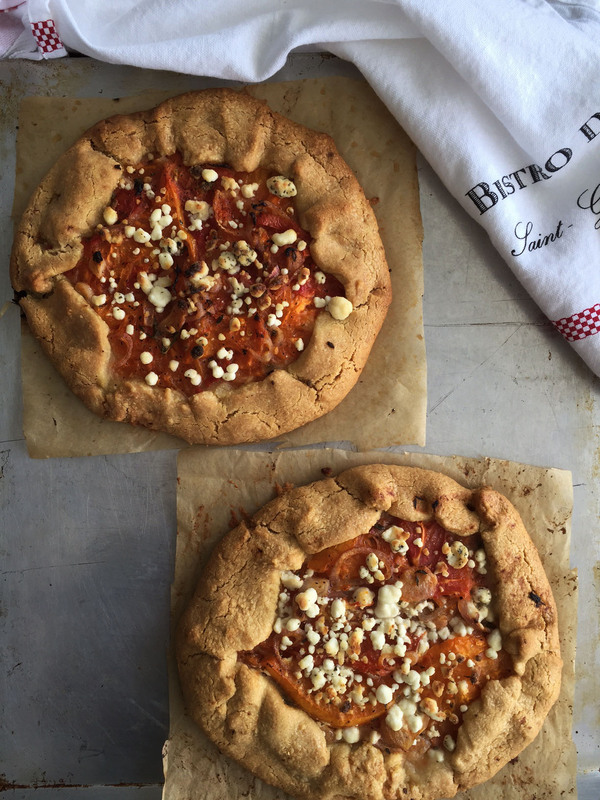 Place another piece of parchment paper on top of your dough ball. Roll out a circle using a rolling pin or what you have at hand (I used a wine bottle). Make sure the dough is thin but not so thin, so it doesn’t stick to the parchment when you want to roll the edges. Remove the top piece of parchment paper and arrange your tomatoes and shallots on top of the dough, leaving an inch and a half border of dough around the tomatoes. 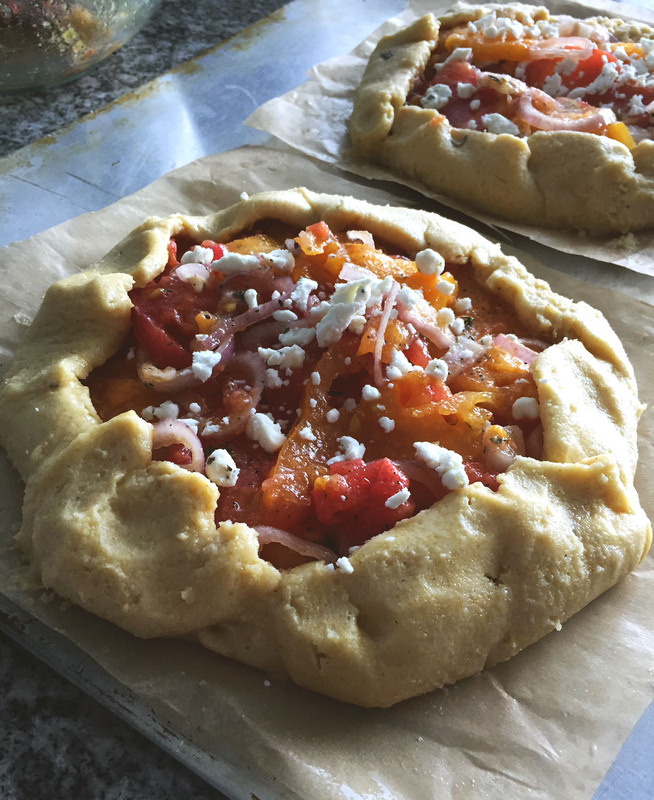 Sprinkle the tomatoes with goat cheese and carefully fold the edges of your dough over to partially cover the tomatoes. Slide the parchment paper that is holding the galette onto a baking pan. Bake for 25 minutes or until the crust is golden brown. Compré estos tomates heirloom hermosos con esta receta en mente. Fue mi primera vez haciendo galettes y salieron deliciosos, asi que vale la pena intentar esta receta! Saca la masa y haz una bola y envuelvela en papel pergamino. Ponla en el refrigerador por 30 minutos. 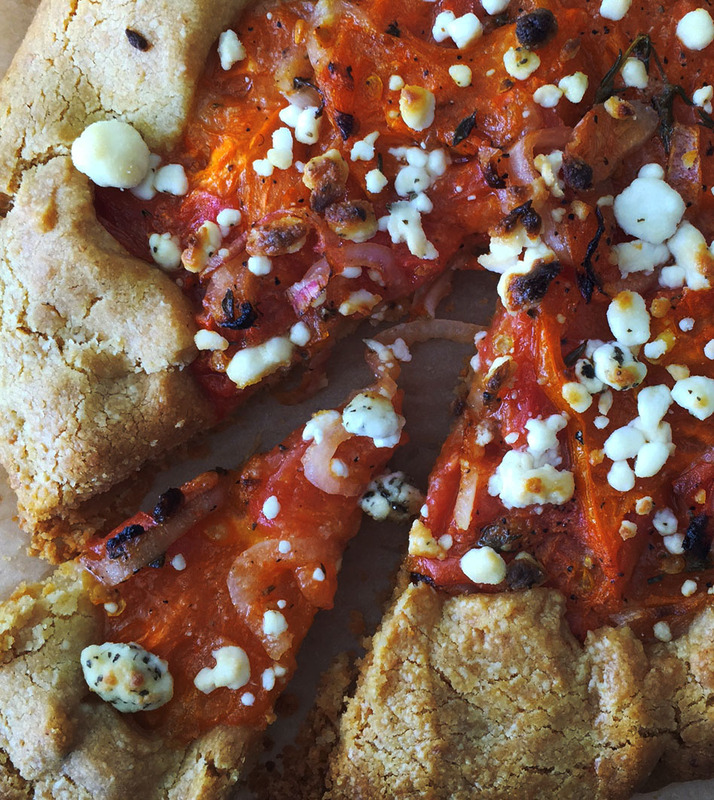 Corta los tomates heirloom y los shalotes. Ponlos en un bol y agrega sal y pimienta al gusto, el tomillo y un chorrito de aceite de olive. Mezclalos bien. Transcurridos los 30 minutos, abre el papel pergamino y pon otro pedazo de papel pergamino sobre la masa. Con un rodillo, o lo que tengas a mano (yo use una botella de vino), aplasta la masa suavemente hacia todas direcciones hasta que se haga una masa delgada (no tan delgada para que no se pegue el papel pergamino cuando la vayas a doblar en los bordes).rea los tomates con queso de cabra y con cuidado dobla los bordes de la masa alrededor de los tomates. Con cuidado pon el papel pergamino con la galette sobre una bandeja de hornear y hornea por 25 minutos o hasta que la masa este dorada. Mix well all the ingredients in a bowl. Grease the tins in a cupcake baking tray and pour the mixture in. Put in the oven and cook for around 10 minutes or until you insert a knife and it comes out clean. Mezcla bien todos los ingredientes en un bol. Engrasa los moldes de una bandeja de hacer cupcakes y divide la mezcla entre 10 moldecitos. Introduce al horno y cocínalos por aproximadamente 10 minutos, o hasta que insertes un cuchillo y salga limpio. Heat up in a small pot the blueberries with the tablespoon of water until it forms a sauce. 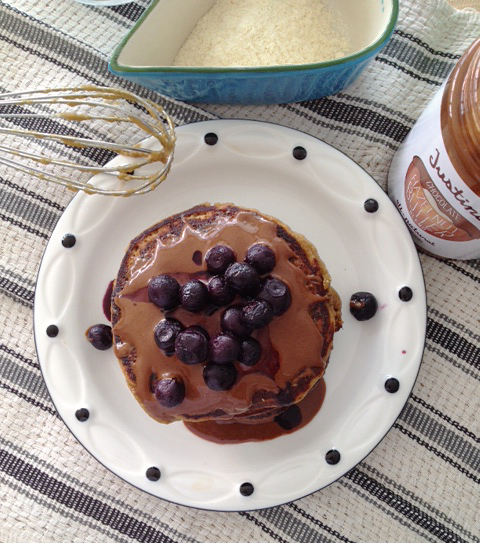 Serve the pancakes on top of each other, layering them with the chocolate hazelnut butter and topping them with the blueberries. Happy Sunday! No se enganen con la foto, no son tan dulces como parecen! En una ollita calienta las blueberries con el agua y déjalo cocinando unos 6 minutos hasta que se haga como una salsita. Sirve los pancakes uno encima del otro poniéndoles una capa de la mantequilla de avellanas y chocolate entre cada uno y sirviendo las blueberries encima. Feliz Domingo!